Serena Williams staged an impressive comeback against Caroline Wozniacki to claim a place in the quarter-finals of the Madrid Open. The ninth-seeded American was comprehensively outplayed in the opening set of their third-round tie on Thursday, but hit back to wrap up a 1-6 6-3 6-2 victory in one hour and 42 minutes. Williams was broken three times in the first set by her Danish opponent, seeded sixth, but turned the tables on Wozniacki with four breaks of her own over the next two sets. “I had a slow start today, I don’t know why,” said the 30-year-old. “I was sluggish and mentally maybe fighting some demons. “I started trying to play better, the first set was not me at all. I knew I had to get better. I just tried to play my game.” Williams has now won 10 straight matches on clay, a run which took in the title in Charleston last month. The reward for her latest win is a last-eight clash with second seed Maria Sharapova. The Russian, a recent winner in Stuttgart, advanced after opponent Lucie Safarova withdrew before their clash through illness. Fourth seed Agnieszka Radwanska also progressed to the next round, beating Roberta Vinci, of Italy, 7-6 (7/1) 6-4. Qualifier Lucie Hradecka, who accounted for third seed Petra Kvitova on Wednesday, continued her run with a 6-2 7-6 (7/5) success over Ekaterina Makarova to reach the quarter-finals. Masha finally wins her first title of 2012. Maria Sharapova came out on top in the battle between the world’s top two after convincingly defeating Victoria Azarenka in the final of the Porsche Grand Prix in Stuttgart. The Russian won her first title of the year, while denying world number one Azarenka her fifth, with a 6-1 6-4 victory in one hour, 24 minutes. Belarusian Azarenka, who had won 29 of her 30 matches in 2012 coming into the final, managed to fashion just one break point, which she failed to take, while Sharapova won three of the 11 she had. The victory saw second seed Sharapova gain a measure of revenge for her defeats to Azarenka in the finals of the Australian Open, Indian Wells and Miami this year. 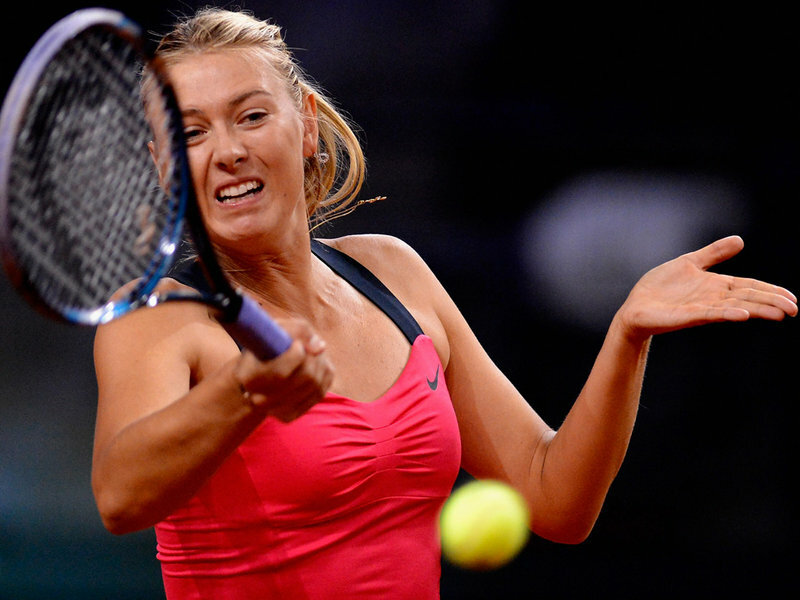 Victoria Azarenka and Maria Sharapova will meet in the final of the Porsche Grand Prix in Stuttgart on Sunday. Top two seeds Victoria Azarenka and Maria Sharapova will meet in the final of the Porsche Grand Prix in Stuttgart on Sunday after winning their respective semifinals. After all four of the world’s top ranked players made it through to the semis of a WTA event for the first time since 2009, it was the leading duo who progressed through as Azarenka knocked out Agnieszka Radwanska and Sharapova downed Petra Kvitova. World number one Azarenka had an epic quarter-final against Mona Barthel that lasted almost three hours, but the Belarusian needed less than half that to defeat in-form Pole Radwanska 6-1 6-3 to claim a tour-high 29th win in 30 matches this year. Radwanska’s loss was only her fifth in 33 matches in 2012, with all five of those defeats coming at the hands of Azarenka. Russian Sharapova also needed three hours to win her quarter-final against Sam Stosur and the world number two was made to work hard again by Petra Kvitova before beating the Czech third seed 6-4 7-6 (7/3). Semi finals set in Stuttgart. Maria Sharapova came through a three-hour epic against Sam Stosur to reach the semi-finals of the Porsche Grand Prix in Stuttgart. The world number two claimed her 10th win in 11 career meetings with the Australian but she had to do it the hard way, coming from a set down after two tie-breaks and a hard-fought deciding set. Both players’ serves held firm throughout the first set, won by Stosur on a tie-break before Sharapova responded in kind after a second set featuring one break apiece. One more was enough for the Russian to win the decider and wrap up a 6-7 (5/7) 7-6 (7/5) 7-5 victory. She will face Petra Kvitova, her conqueror in last year’s Wimbledon final, after the Czech left-hander cruised past Germany’s Angelique Kerber 6-4 6-4. Kvitova broke three times in a scrappy first set before taking the second with a solitary break. Top seed Victoria Azarenka was also made to battle hard before downing Germany’s Mona Barthel in three sets. The Belarusian prevailed 6-4 6-7 (3/7) 7-5 in two hours 49 minutes, taking seven of a huge 22 break points en route, but will almost certainly have to improve on that conversion rate if she is to get past Agnieska Radwanska to reach the final. Polish fourth seed Radwanska came from a set down to beat China’s Li Na 3-6 6-2 6-3 in exactly two hours. Ivanovic loses, Jankovic retires, Sharapova thru on a gift. Ana slipped to a 7-5, 7-6(4) defeat to Germany’s Mona Barthel in the first round of the Porsche Tennis Grand Prix in Stuttgart. Ana led 5-3, 30-0 and had two set points in the opening set, but was unable to convert them. Unusually for a WTA match taking place on clay, there were no breaks of serve in the second set, although Ana again failed to take her opportunities, as she earned three break points that went unconverted. To her credit, Barthel served brilliantly, smacking down 11 aces during the one hour, 43-minute match. In losing this match Ana, who only arrived in Stuttgart on Monday afternoon following the weekend’s Fed Cup tie in Moscow, suffered only her third opening round loss since she began working with coach Nigel Sears. Maria Sharapova was a quick-fire winner in the Porsche Grand Prix in Stuttgart when French opponent Alize Cornet retired just 50 minutes into their second-round match. Sharapova, seeded two, had won the first set 6-3 and taken the opening game of the second before Cornet signalled she could not continue due to a shoulder injury, handing the Russian a place in the last eight. Also in the second round, in-form fourth seed Agnieszka Radwanska advanced with a 6-3 6-4 win over qualifier Greta Arn, of Hungary, breaking her opponent four times in their 78-minute match. Former world number one Jelena Jankovic (back) was another retirement, pulling out when trailing 6-3 1-0 to sixth seed Caroline Wozniacki in their first-round contest. Agnieszka Radwanska claimed her second title of the season with a 7-5 6-4 victory over Maria Sharapova. The first set was heading to a tie-break when Sharapova, down 6-5, suddenly lost her previously solid service game. Sharapova produced two loose shots and then a volley into the net to leave her trailing 0-40 and although Radwanska wobbled with two tame returns into the net, Sharapova failed to clear the net herself to hand her opponent the set. And the second set followed a similar pattern – both players solid on serve but Radwanska coming out on top when it mattered. Radwanska fought back from 0-30 down to go 6-5 up and force Sharapova to hold serve to stay in the match. The Russian looked agitated and was let down by some reckless strokes, twice going long on returns, as Radwanska lured her into defeat. Saharapova v. Radwanska will be evenly matched in the Sony Ericsson Final. Sharapova will face fifth seed Agnieszka Radwanska in the final after the Pole beat Marion Bartoli 6-4 6-2 in the second semi on Thursday. French seventh seed Bartoli could not repeat the heroics of her semi-final victory over world number one Victoria Azarenka, whose 26-match winning run she ended on Wednesday. Azarenka goes to 23-0 with another title at Indian Wells. Sharapova suffered again at the hands of the Belarusian having also lost when the two met in the final of the Australian Open earlier this year. She was broken right at the start of the contest and then again in the seventh game of the opening set, Azarenka going 5-2 ahead thanks to a rasping forehand winner. Sharapova continued to have issues with her serve at the start of the second set before finally showing some fight at 0-3, breaking the top seed for the first time by clawing her way back from 15-40 down. However, Azarenka responded by breaking straight back to move three clear again and although her rival held for the first time in the set in the seventh game, it was only ever a case of delaying the inevitable. Azarenka and Sharapova will meet again in the final at Indian Wells. Azarenka will face second seed Maria Sharapova, who was 6-4 0-1 up when opponent Ana Ivanovic was forced to withdraw with what was later confirmed as a left hip injury. Trailing 5-4, Ivanovic took a break nearly eight minutes in length for, at the time, unknown reasons. But anyone who thought this could turn into another three-hour match for Sharapova was sorely mistaken just two games later, after the Russian served out the opening set. A hip injury had affected Ivanovic, so much so that her coach, Nigel Sears, all but told her to let this one go. The Serb soldiered out for one more game, which she won, but the pain was too much to bear; a short session with the trainer confirmed the inevitable. Ivanovic told Sharapova it was over, and it’s still more than four years since the two have played a completed match. 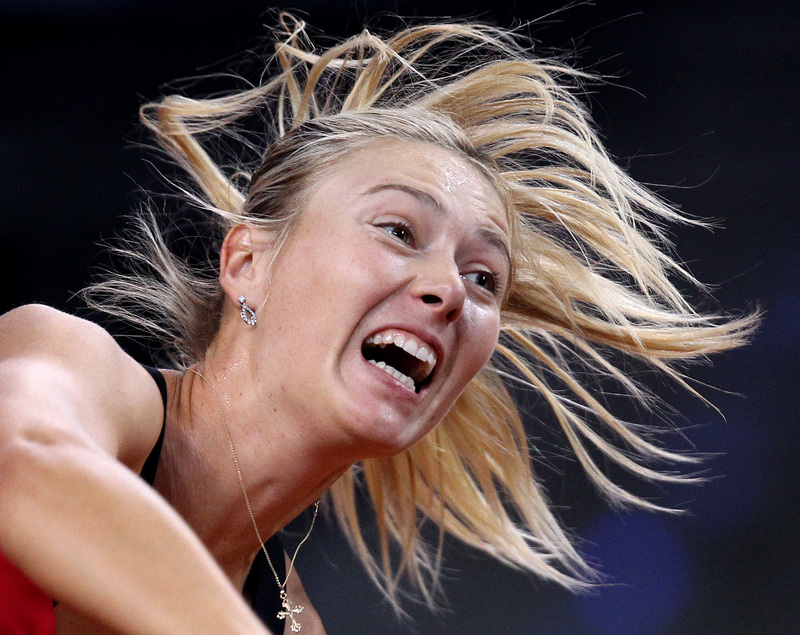 Sharapova comes from behind to move into the semifinal against Ivanovic. Three-time grand slam winner Sharapova, the second seed, battled to a 3-6 7-5 6-2 win over Maria Kirilenko in the women’s quarter-finals of the joint WTA and ATP event in California. Sharapova will face Ivanovic, who eased past a stricken Marion Bartoli 6-3 6-4 in a rematch of their 2011 quarter-final. Sharapova had cruised through her first three matches without dropping a set but quickly ran into trouble against Kirilenko, who had won eight of her previous nine three-set matches this year. “I tried to keep my head up today even though I wasn’t playing my best,” said Sharapova, the 2006 champion. “Towards the end, I started to play better and move better.” Sharapova needed three hours and five minutes to dispatch Kirilenko in the first meeting between the two since the opening round of the 2010 Australian Open. Kirilenko is getting a reputation as the WTA Tour’s ironwoman. This was her third straight three-setter and the second time in the tournament she played a match lasting more than three hours. But despite breaking the former world No.1 twice in winning the opening set in 43 minutes, Kirilenko was unable to conquer her more-fancied countrywoman. Ivanovic has made it to at least the Indian Wells quarter-finals on five occasions, winning the title four years ago. Bartoli’s exit means last year’s winner Caroline Wozniacki and runner-up are out of the women’s draw.